Front Floor Mat for the left hand drive 1928-29 Model A with the hand brake in front of the gear lever. Authentic design. The same as the ford design mat that came in your car when it was new. Front Floor Mat for the left hand drive 1929-31 Model A with the hand brake to the right of the gear lever. Authentic design. 1928-29 Model A Ford tudor sedan rear mat. These are much improved quality over what has been available in the past. Same thick durable rubber as our front floor mats. The Tudor Sedan rear mat ran from the front edge of the rear seat riser all the way to the front seat mounting legs. Made in USA. 1930-31 Model A Ford tudor sedan rear mat. Rumble seat floor mat for the 1928-31 Model A. Good heavy rubber mat with the original starburst design. Fits the rumble floor of Coupes, Roadsters and 68-A and 68B Cabriolets. Floor Mat Studs for the 1928-31 Model A Ford. These are the special studs used to hold the floor mat in place. 4 per set. Made in USA. These are the female black oxide snaps, to hold carpet to floor. 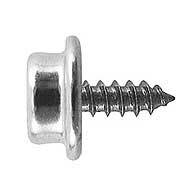 The male A-37106-SP snap attaches to the floor and this female fastener attaches to the carpet. Usually seven for the front and seven for the rear are needed.